04 Feb Why do I keep pulling my HAMSTRING! If you continue to do nothing about your injury, you will likely re-injure it again, potentially much worse than it originally was. Not only this, there is a whole list of other potential injuries you may face as a result of your dodgy hamstring, such as increased risk of back and knee pain. It frustrates me that so many people are not doing anything about hamstring injuries, putting a bit of ice on it for a day or two and then resting for a few weeks, only to be 50/50 about whether they can play on it once they do return to sport. Research has PROVEN that strength is one of the few modifiable risk factors for preventing hamstring strains. What does this mean?? 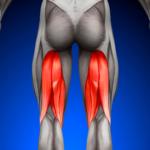 Strong hamstrings are far less likely to be torn or injured. In particular, eccentric strength is important. Eccentric strength is the ability of your hamstrings to control movement whilst the muscle is lengthening. For example, when you overstretch trying to get to a ball when playing tennis, it is your hamstrings that are working hard to prevent you from essentially doing the splits. And if they are not strong enough to deal with that amount of force, BANG… there goes your hammy. The good news is that new research is suggesting we can start more advanced strength exercises much earlier than we may have previously thought. As early as 3 days after an acute hamstring injury, depending on the severity of the injury. uries. The easiest way to do this? Stretching. Long term stretching, not just before your game, is how you are going to improve your fascicle length. Whether you have never strained your hamstring or have done it 5 times, you should be engaging in a regular stretching routine to help prevent a re-occurring hamstring problem. That’s why we have created a Specialised Hamstring Rehabilitation Protocol that will make your hamstring’s stronger and more robust than ever before. If you have recently suffered a hamstring injury, if you have a history of hamstring injuries, or if you looking to improve your performance and decrease your risk of injury, give us a call on 9905 0048 to make your appointment.